Model: This car has an mfx digital decoder and extensive sound functions. It also has factory-installed LED interior lighting that can be controlled digitally. The car has built-in marker lights that can be controlled digitally. Warm white and red LEDs are used for the lighting. Current-conducing couplings/couplers can be used on this car. This function can be controlled digitally when current-conducting couplings/couplers are used. A pickup shoe is mounted on the car. This auxiliary baggage car has "swan neck trucks" also known as "Pennsylvania trucks". The minimum radius for operation is 360 mm / 14-3/16". Length over the buffers approximately 26 cm / 10-1/4". 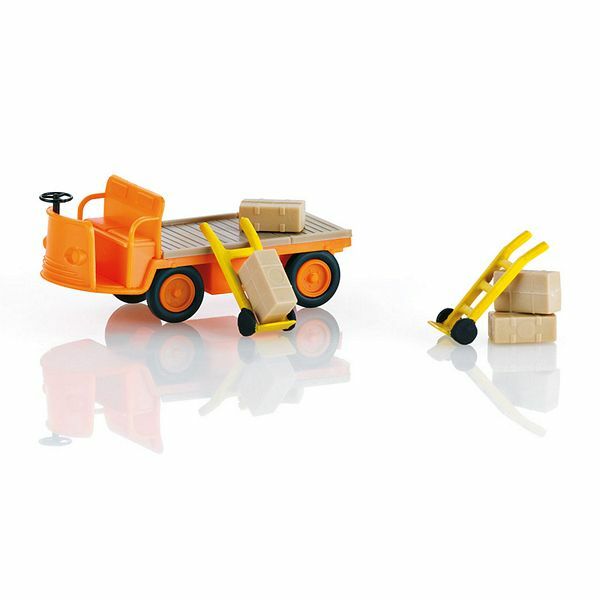 Also included with this car: an electric cart, two carts for sacks, and 4 packages from the firm Paul M. Preiser GmbH. The functions and sounds build upon one another and give a view of a scene that could have played out at some station at this time. Imagine a late train. Freight must be loaded. The load also comes somewhat delayed to the station platform. The conductor and the load supervisor are accordingly excited. Then something goes wrong with the loading of the passengers. More power to the person who can then find a moment of quiet somewhere. In the Fifties, the new German Federal Railroad knew how to remedy the lack of four-axle baggage cars quickly with improvisation and creativity. It used its large roster of type MCi 2-axle auxiliary passenger cars to build four-axle auxiliary baggage cars. This was done by joining together two wood MCi car bodies with their frames. In the process, the frames were equipped with truss rods to reinforce the car sides. Two sturdy bolsters had to be installed for the American design swan's neck or "Pennsylvania" style trucks that were used in most cases. Two 2-part revolving doors on each side gave access to the cars. Critical improvements were made to the cars starting in 1957, for in addition to rubber tube diaphragms the load area was also equipped with a service compartment. Further updating of the cars took place between 1974 and 1982. Based on the prototype of modern freight cars the wood siding on almost 300 cars was sheathed in sheet steel during major overhauls. Most of the cars were now designated MDyge 986 (with additional heating lines for electric train heating). Several units remained as the type MDyg 986 (with steam heat only). With a few exceptions, the cars were rated for a maximum speed of 120 km/h / 75 mph. Just a few with roller bearings were rated for 140 km/h / 88 mph and were therefore allowed to run in express trains and fast mail trains. These 23 meter / 75 foot 5-1/2 inch long cars were a daily sight in passenger and express freight service on the DB well into the Nineties. Yet after a bad railroad accident at Northeim on November 15, 1992, the auxiliary baggage cars were withdrawn from passenger train service relatively quickly and were retired, but many experienced a second career by being converted to maintenance train cars. 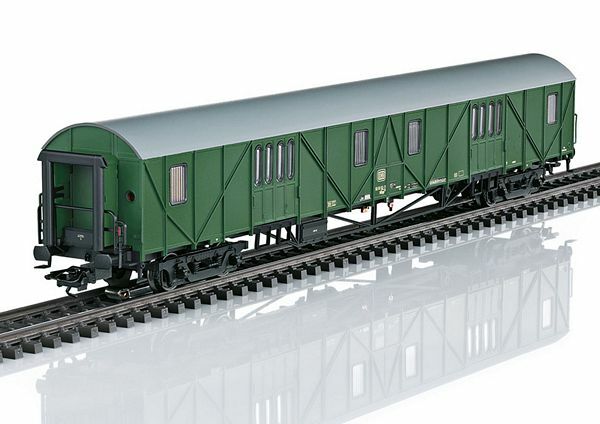 A car set to go with this car can be found in the Märklin H0 assortment under item number 43993. 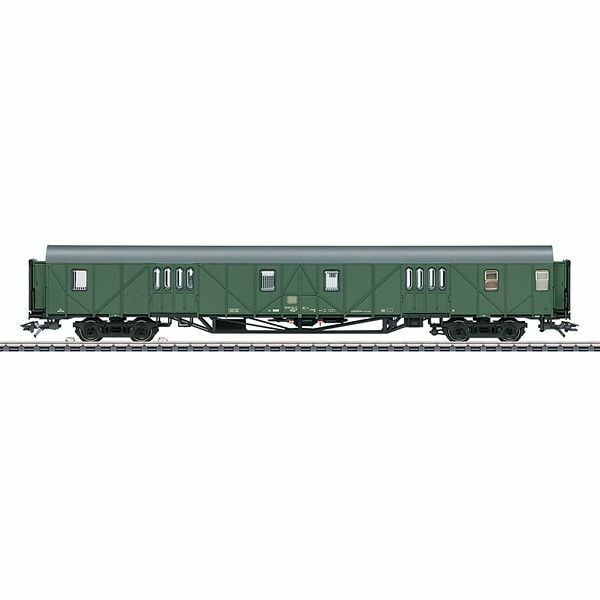 The electric locomotive to go with this car can be found in the Märklin H0 assortment under item number 37685.